The ultimate gift edition of L. Frank Baum’s beloved storyjust in time to celebrate the 70th anniversary of MGM’s classic film adaptation! Featuring a ribbon marker, this magical version is redesigned and reproduced from the original art.Charles Santore has crafted a very personal, highly visual, and dazzling interpretation, with a carefully condensed text that uses virtually no words other than Baum’s own. 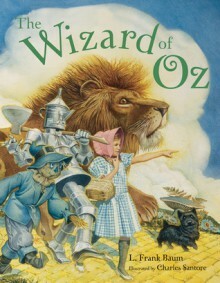 Readers of all ages will follow the Yellow Brick Road on an unforgettable journey that takes them from Dorothy’s gray Kansas home into the blue Munchkin land; the sparkling bejeweled Emerald City; the dark, foreboding forest; and the ruby-red throne room of Glinda the Good Witch.Michael Patrick Hearn, the world’s leading authority on The Wizard of Oz and L. Frank Baum, provides an enlightening introduction.